If there’s one take away from Ain’t Too Proud it’s that the underdogs always prevail when there’s passion to succeed and adapt. The legendary music artisans get a styling retelling of their journey in one of the sharpest choreographical offerings of the year. Musical making phenom Des MacAnuff knows better than anyone if it’s not broke don’t fix it. Which is why Ain’t Too Proud follows the same formulaic rags to riches success as Jersey Boys along with the same ups and downs of starry eyed youngsters trying to make a name for themself. Let’s not forget that the Great Lakes State is not the Garden State so the similarities end there. 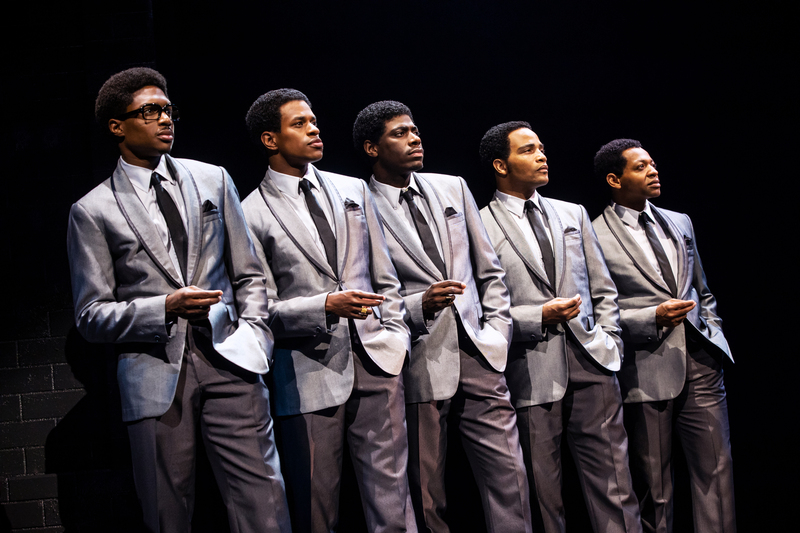 And when you’re trying to become Motown’s crossover band, the stakes are gonna be much higher for 5 clean cut Detroit chums that went on to become chart-topping heroes The Temptations and ironically named history’s top ranked R&B group by Billboard Magazine. Discovered by legendary lable god Berry Gordy (Jahi Kearse) who demonstrated notable patience with their first two dozen singles before securing their first hit, founding band member Ottis Williams (Derrick Baskin) goes into the business with the right motivation to later deliver ‘My Girl’ and ‘Just My Imagination’ ‘Papa Was a Rolling Stone’ just to name a few. With success comes tension and one by one band members start to disappear with no end in sight to the musical territory left to cover. Say what you will about jukebox offerings but The Life and Times of The Tempations is a touching tale of the sacrifices made getting to the top and staying there. The emotional toll of saying goodbye to a business partner and never regretting the difficult decisions that had to be made. The song and dance pieces are utterly unforgettable which gives the show the stage signature that can’t be smudged. It may just be the fanciest footwork and vivacious vocal blend of the year to touch down in our city. Cheering for the underdogs will never grow old. Ain’t Too Proud celebratory salute goes to show that musical magic is found not manufactured.